Your opinion is important to us! That’s why we’d like to thank you by automatically entering you to win a monthly give away upon submission of you RYOBI Outdoor tool review! 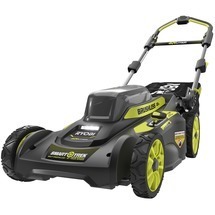 The New RYOBI 40V 21” BRUSHLESS SMART TREK™ Mower powerful, intuitive and intelligent. With the performance of a high-end gas mower and all the benefits of cordless, there is no need to compromise. Nothing gives your curb appeal a boost like a good cleaning! Our new lineup of RYOBI Pressure Washer Accessories save you time, energy and frustration. The RYOBI 2300 Watt Bluetooth Inverter Generator takes the user's experience to a whole new level with integrated Bluetooth Technology and the GenControl Smartphone App. View the newest additions to the 18V ONE+™ System. We are proud to have the same battery system and retail location since 1996. Build your cordless system with confidence. Pro Features. Affordable Prices.